Here’s the recipe the way I did it (just minor tweaks from the one in the mag). 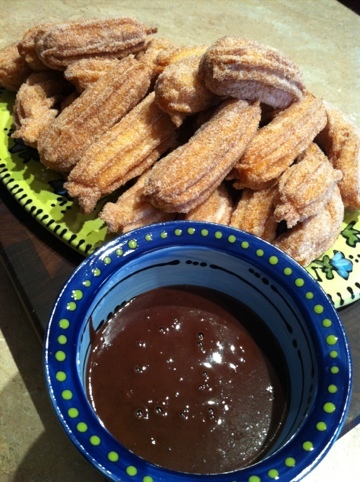 I made the churros first, but in order to enjoy everything warm, start with the sauce. 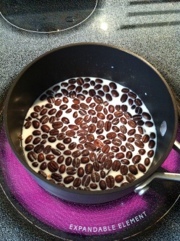 Put the milk and espresso beans in a small saucepan and bring it just to a boil. Remove from the heat, cover, and let stand for 15 minutes. Strain the milk in to a measuring cup. Wipe out your saucepan and put the milk back in it. Bring it to just a simmer, remove from heat, and stir in your chocolate until its melted. 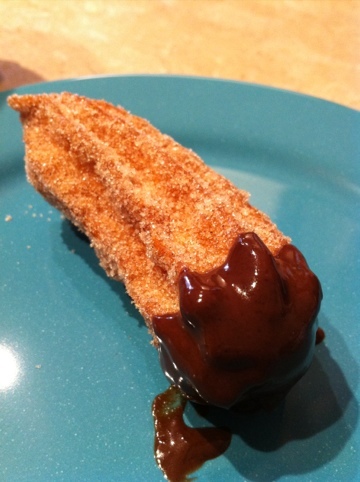 Whisk until smooth and keep it warm while you make the churros. In a medium saucepan combine the 1 tsp sugar with 1 cup water, butter, and salt and bring to a boil. Remove from heat and add the flour all at once. Stir until incorporated. Scrape the mixture into a medium sized bowl. 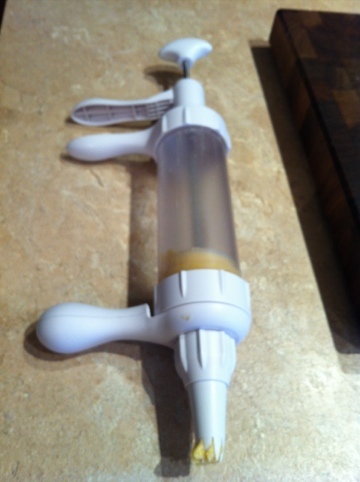 Beat eggs in one at a time, with an electric mixer until batter is smooth. Add vanilla and citrus zests. Now put your batter in a pastry bag with a 1/2 star tip (or the closest thing to it). If you have awesome friends like I do (thanks, Eliza and Nik!) you might have one of these awesome contraptions which make tasks like this lots easier. Now that you’ve loaded your batter, pour about 2 inches of oil in a large saucepan and turn the burner to moderate high heat so it can start warming up. You want the oil to reach 350 ultimately. I use a candy thermometer to make sure I get the right temp but I’m sure there are other ways. While that’s heating up get a bowl out (a flatter, shallow bowl works best I think) and mix the 1/2 cup sugar and the cinnamon and cardamom together in it. Get out a rack or something you can use to drain your churros when they come out of the oil. By now your oil should be hot and you should be ready for the scary part. Okay, it’s not that scary but getting the churro batter in the oil requires some coordination (of which I have none). Here’s what I did: push some batter out so it’s hanging above the oil (as long as you want, but I did about 4 inches). With a knife cut across the batter at the piping tip so it will drop gently into the oil. 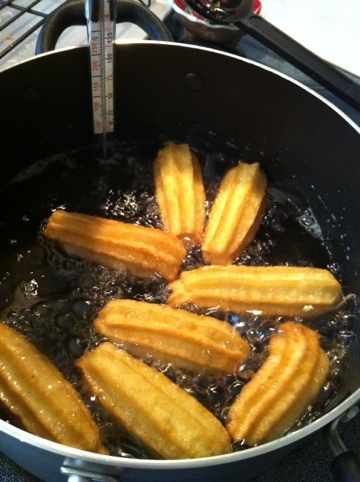 If the batter sticks to the knife just gently drag the knife across the surface of the oil and the churro will let go. Your pan should look like this once you have a batch of churros in the oil. Now fry them for about 6 minutes or until they are golden brown and look cooked through. Some of mine were more done than others but they all tasted great. Once they are done scoop them out of the oil with a slotted spoon and allow them to drain for a few seconds. I had a helper (thanks hubby!) who then coated them in the sugar mixture, but I’d you don’t, just coat them and then fry your next batch. 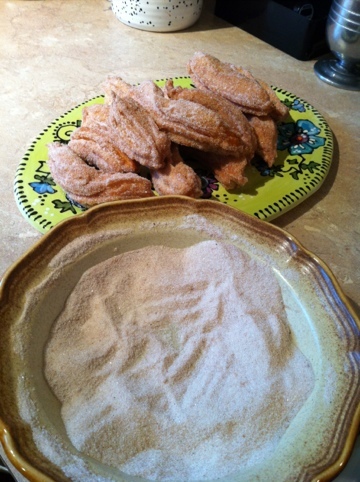 Once you have fried and coated all your batter you should have a lovely pile of churros. Now just dip them in that warm mocha sauce and enjoy! Categories: Baking, Delectable Dabbling, Food, Sweets | Tags: comfort food, food and wine magazine, Fried foods | Permalink.